← Does an agency that represents itself have a fool for a client? Will the Chilean miners now face an even greater challenge? 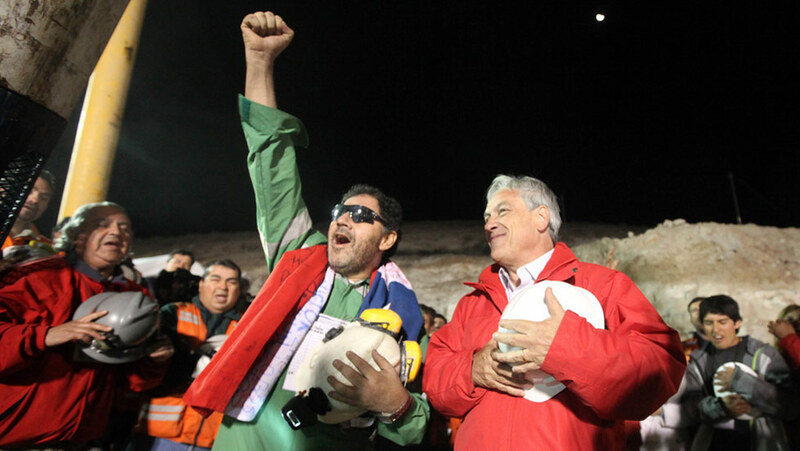 Now that the 33 men trapped in a mine in San Jose, Chile for 69 days have been rescued the world has breathed a collective sigh of relief. I watched much of the rescue yesterday both at my hotel and on my Jet Blue flight back to JFK from San Francisco. It was a remarkable and unforgettable experience just to watch it live. Already there have been reports that the miners would be paid as much as $400,000 each for the rights to the movie about their ordeal. And it is likely that not one of those miners will ever go down a mine shaft again. I’m not sure that they can be referred to as heroes although they certainly are being treated as such. While it’s true that the camaraderie and teamwork displayed by the miners was quite likely responsible for their survival, the ‘heroism’ sure to be dramatized on film may be more of a testament to Chilean resolve than actual heroism. But how about the families of these men aged 19-63? And in particular what will happen to the wives who were shown waiting anxiously as the men were slowly raised one by one up the 2,300 foot metal encased shaft. The fame, notoriety, and fortune apparently heading the way of the miners and their families will be nothing like they could have ever imagined. While the miners might have the right tools to operate 2,300 feet below the ground, I thinkit may be less likely that they are equipped with the tools to handle the media onslaught much less the gold diggers (no pun intended) that will be calling all the time. The beauty of the story has likely had its pinnacle and from here on the denouement very well may end up making the miners look like a bunch of past lottery winners. I don’t mean to be a downer here but the raw emotion and purity of spirit that existed throughout the ordeal as well as immediately afterward will wane all too quickly. The marriage proposal by one of the miners while he was trapped was poignant, as are many of the statements we heard yesterday and today. But fame has a huge price and the media will have its way with these brave men and their families. I think that’s kind of sad and I actually feel a bit sorry for all of them. And that does not seem right either. This entry was posted in Living in the World Today, Marketing stuff, Media and tagged Chilean miner fame and fortune, Chilean miner media frenzy, Chilean miners, Jet Blue, mine rescue, what will happen to Chilean miners. Bookmark the permalink.